As Tony Feher — who uses objects like bottles, glass jars, and sticky-notes in his work — admitted, the most commonplace objects are sometimes the most difficult to maintain. “Nothing but disaster follows me around,” he joked, before regaling the crowd with horrific tales of artwork annihilation. 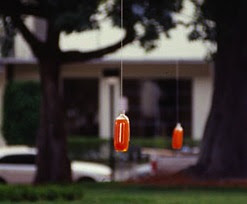 He recalled how visitors repeatedly damaged an installation of Fanta bottles hanging on trees in a public park. “I call it the piñata effect,” he said. “If you have something that’s hanging in front of you, and it starts swaying, men just have to hit that.” Feher reported that one man even walked through, popped open a bottle, and enjoyed a refreshing beverage.